Edward VIII (Edward Albert Christian George Andrew Patrick David; June 23, 1894—May 28, 1972) was King of England & the Dominions of the British Empire, and Emperor of India, from January 20, 1936 until his abdication on 11 December the same year. Edward was the eldest son of King George V and Queen Mary. Edward was officially invested as Prince of Wales in a special ceremony on July 13, 1911. Throughout the 1920s, Edward, as Prince of Wales, represented his father, King George V, at home and abroad on many occasions. On one such visits, he arrived in India in December 1921 and returned to the UK in June 1922. During this visit, he travelled far and wide across the Indian subcontinent where he was received by the local rulers, Rajas and Maharajas and a great deal of ceremonial pomp and joy was exhibited through costly gifts and presents by the aristocrats of Indian states and provinces. 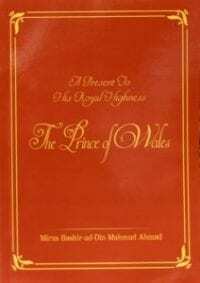 The Head of the Ahmadiyya Muslim Community at that time, Hazrat Mirza Bashir-ud-Deen Mahmud Ahmad, may Allah be pleased with him, revived the tradition of the Holy Prophet Muhammad, peace and blessings of Allah be upon him, and that of the Promised Messiah, on whom be peace, and welcomed this member of the Royal Family by presenting to him the message of Islam.